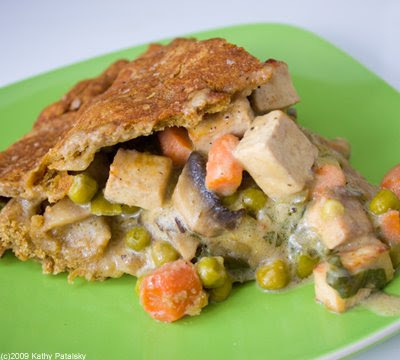 My Tofu Pot Pie with Homestyle Veggies. Vegan. Pot Pie Memories. 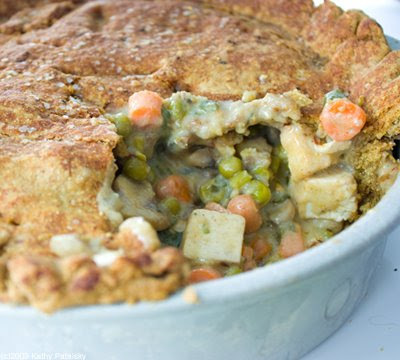 I have been a fan of pot pie ever since I was a little girl. 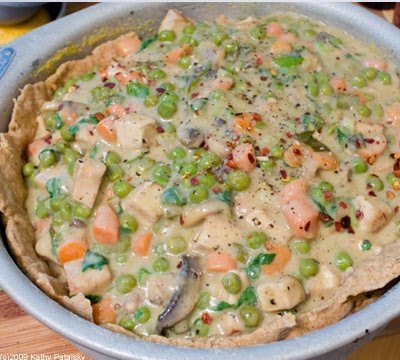 I'm a bit embarrassed to admit that I used to beg my mom to buy those individual chicken pot pies from the freezer section at the store. I loved them. Until one day in junior high school when I actually read the label and it said something like 1200 calorie and 70 grams of fat per pie. 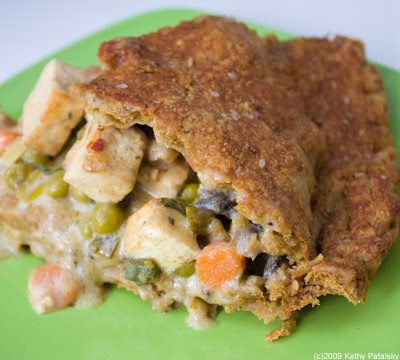 I freaked out and swore off ever eating a pot pie again. 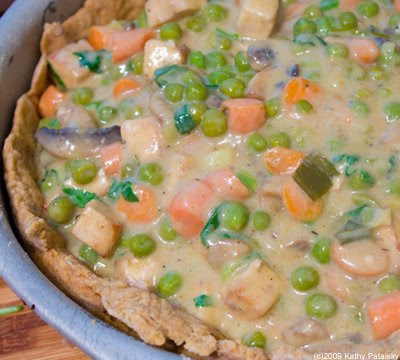 Until I tried Amy's Kitchen Dairy-Free pot pie. I fell back in love with them. Amy's dairy-free version is made with tofu and it's vegan-and delicious. Flaky crust. Creamy filling. 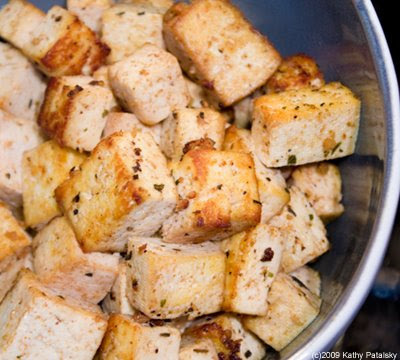 Thick tofu cubes. Yum. But still frozen. I wanted a fresh pie! Then one day on the Food Network I saw Paula Deen whipping up a quickie version of a pot pie for an 'easy dinners' episode of her show. Easy? I thought wow, it does look kinda easy. So I decided to give it a try using all vegan ingredients. *it's better to have a little extra dough than to be short a bit. That's why this dough recipe overestimates the crust needs a bit. *optional a dash of liquid smoke. 1) I like to start by cooking the tofu. Saute the cubed tofu in the cumin, olive oil, lemon juice and pepper. Make sure to get a nice brown sear on a few of the sides to firm up to edges and maximize the flavor and texture of the tofu. Simply pouring raw tofu into your veggies would be bland and mushy. Once they are cooked perfectly (to a stage where you could eat and enjoy them as such) they are done. Set the tofu aside. 2) Onto the veggies. Chop and prep all your veggies. Try to slice, dice and chop everything about the same size. This helps with cooking and when eating. I used leftover organic baby carrots that I had in the fridge-perfect use for them. And easy to chop into small chunks. 3) Now saute the veggies in a medium sized soup pot. Add the oil, lemon juice and cumin to the pan. Next add in the scallions and part of the black pepper. Saute for a few minutes, then add in the buttery spread, mushrooms, carrots, parsley and peas. Saute for a few minutes until the veggies cook down a bit and have absorbed all the liquid. A little browning on the veggies is good too-just like the tofu. 4) Filling Continued. Now you can complete this filling mix by adding in the soy milk, Vegenaise or sour cream, maple syrup, flaxseed meal, remaining pepper and whole wheat flour. Stir. 5) Thickening the Filling. Then slowly stir in the arrowroot powder a pinch at a time. Stirring too much in at one time can lead to clumping. 6) Next add the bay leaf. Cover pot with lid and turn on medium to simmer. Note: If the mixture looks a bit watery at this point that is ok. But if it seems a bit too dry add a bit more soy milk (or veggie broth if you have it on hand). 7) Crust. 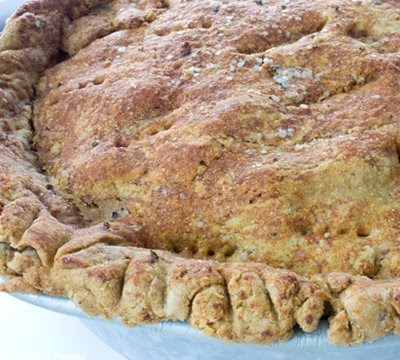 Combine all the dry crust ingredients (except the cornmeal). Mix well. Then add in all the liquid ingredients until a nice dry dough forms. This is similar to a biscuit dough. 8) Pan Prep. 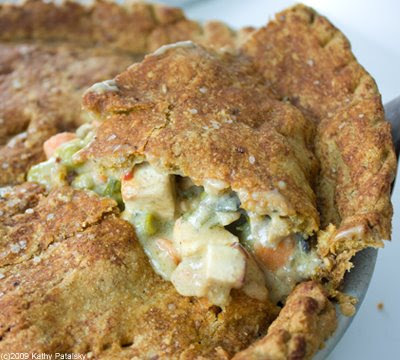 Prepare your pot pie pan for the crust by spraying some canola oil and flouring it with the cornmeal. I used a deep 8" cake pan-not a traditional pie dish because that would be too shallow for all the filling. 9) Dough. Transfer the dough to a floured surface and knead it a bit. Split the dough into two halves-one a bit larger than the other. The larger of the two will be used for the bottom crust. 10) Roll out the bottom dough to about 1/4 inch thick. You do not want this crust to be too thick. Try to keep a nice circle shape. Lay the crust into the prepped pan and press the dough firmly into the sides. Poke a few fork holes in the surface of the crust and fold the side crusts nicely over the sides. Form as you'd like. Stick this pan in the oven to pre-bake the crust for about ten minutes. This will simply ensure that you do not come out with a doughy crust in the bottom of your pie. 11) Roll out the top layer of dough to 1/8 inch thick. I like a super flaky and thin top crust, but you can customize however you'd like. Just make sure the crust is large enough to cover the surface of the filled pan-and a bit more to secure the sides. Set the top crust aside. Note: You can also wait until now to roll out your dough, but mine actually sat just fine on the cutting board for a few minutes. 12) Check on your veggies. Uncover and stir a bit until the filling is a thick, yet gravy-like consistency. Remove the bay leaf. Now gently fold in the cooked tofu cubes. Allow to simmer for a few more minutes while you watch and stir gently-cooking off some of the steam. The filling will firm a bit upon cooling. Be sure to cook off more steam if the mixture seems a bid too watery. 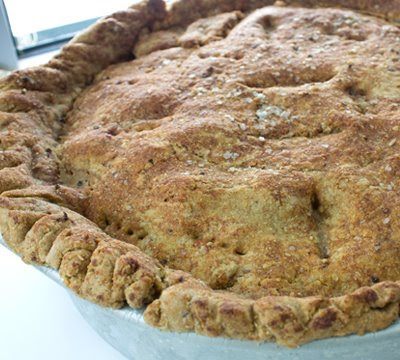 13) Retrieve your pie pan and bottom crust from the oven. Let the pie crust and pie filling cool for about five minutes. Then pour the filling into the pie pan. 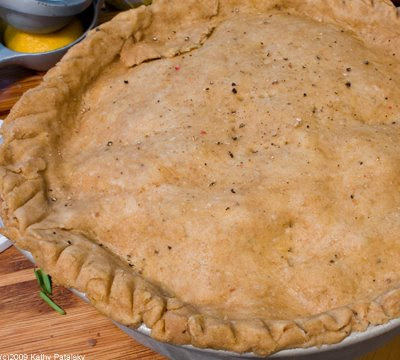 14) Retrieve your top layer of pie dough. (Or rol it out if you haven't yet.) Gently lay your top layer of crust over the filling. Secure the side of the dough with your fingers. 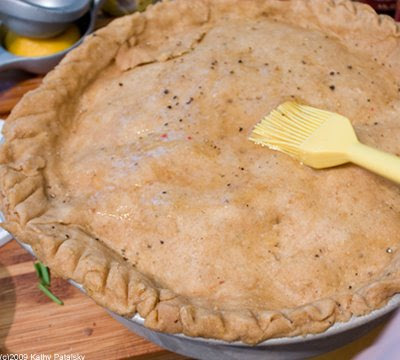 Use the blunt end of a fork to make pretty pie creases in the crust edge. Poke about 6 fork holes in the top of the crust for steam to vent in oven. Brush crust lightly with a simple olive oil/maple syrup/lemon juice mixture. 15) Bake at 350, covered lightly with foil, for about 20 minutes. Remove foil and bake for an additional 10-15 minutes. If crust is not perfectly browned on top, you can use 'broil' for no more than 5 minutes. Watch to make sure the crust doesn't burn or over-brown. Remove from oven 10-20 minutes before serving. You will want the filling to cool a bit for easier serving. Serve in thick slices. A spatula helps in the plating process. Refrigerate the leftovers. 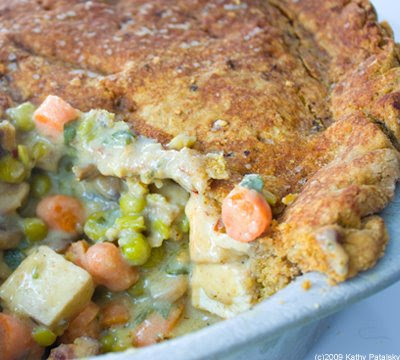 Tofu Pot Pie is great the next day for a easy microwave-warmed lunch! You can even freeze slices to warm up later.